As Bunny Williams says in her foreword to Eddie Ross‘ entertaining new tome, Modern Mix, “Eddie takes the hunt to a new level.” And it’s true – I can’t think of anyone else who has elevated the art of sourcing and styling hidden treasures quite like Eddie. Not only is the book a great guide to navigating the overwhelming world of flea markets, tag sales and other affordable haunts, but it shows how to use your finds to create colorful and winning interiors, tablescapes, gifts and more. Divided into approachable and practical chapters, the book opens each with visually delicious spreads, styled to inspire! 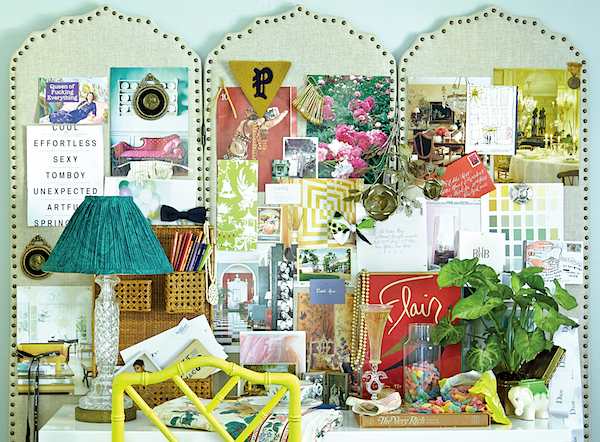 The chapter on Inspire offers hints on what’s to come – how to express your personal style with your finds. Below, Eddie repurposed a linen screen from World Market into a giant inspiration board, filled with a rotating mix of everything that he finds visually compelling, from calligraphy to candy! Eddie’s mantra could easily be “You don’t have to spend a lot of money to live a beautiful life.” In this chapter he shares his own personal journey, from catering in high school, to attending the Culinary Institute of America, to working as a design, decorating and food editor for House Beautiful, Martha Stewart Living, the Food Network and now as East Coast Editor of Better Homes & Gardens. He describes his first dinner party in his tiny studio apartment where thrift shop and estate sale finds set the stage for an evening of epicurean delights, from individual beef wellingtons on gold rimmed porcelain plates to white chocolate soufflés in Limoges ramekins. But as I frequently tout here and Eddie explains in Discover, it’s all about educating your eye. The more you look, the more you’ll find – not only what you like but the value of your finds. And Eddie helps by elucidating different categories such as glass. There are suggestions for use but also helpful hints for the hunt. 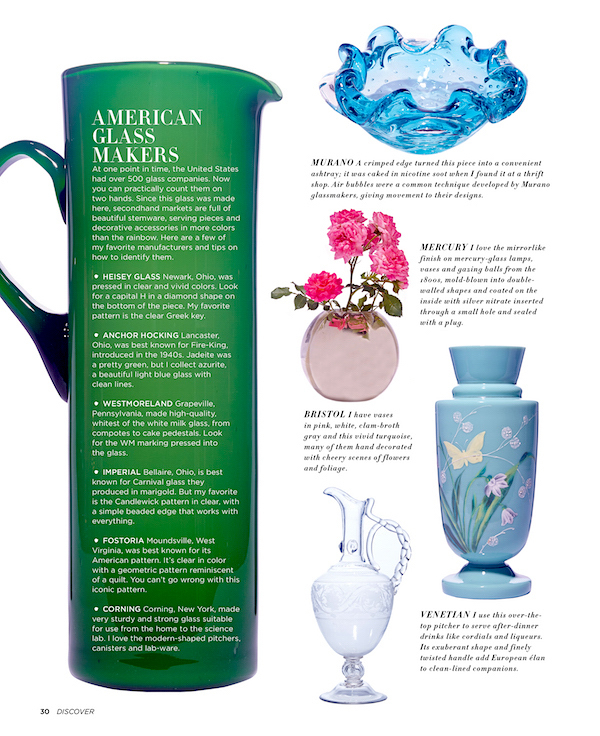 Learn the difference between Bohemian, Opaline and Depression glass. Did you know that the Italians invented Milk glass? Eddie does and from seeing a milk glass vase in a museum, he knew a steal when he saw it on Ebay. 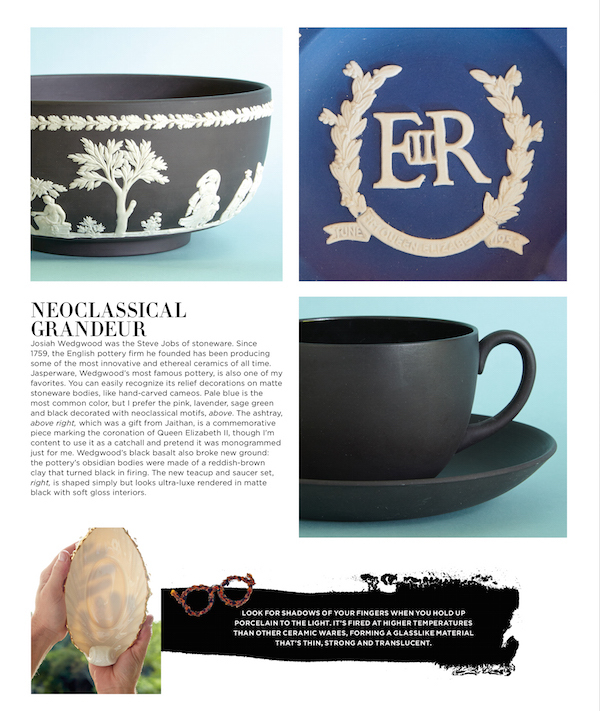 Eddie also walks us through an informative segment on ceramics with makers and marks and a special section on Wedgwood below. Be on the lookout throughout for the little glasses logo where Eddie imparts particularly pertinent pearls of wisdom. “You never know what TREASURE you’ll find when you take the time to look!” In the ACQUIRE chapter, you’ll get essential information for navigating the flea market, thrift stores, estate and tag sales with some of Eddie favorite finds. But he also kindly includes the best ways to acquire online for those more comfortable at the keyboard. The book is worth its price for the chapter on Restore alone. Sharing his favorite tools, techniques, products and craftsmen, Eddie takes us through rejuvenating glass, metal, ceramics, textiles and more. You’ll be less nervous purchasing vintage finds with these resources at your fingertips. 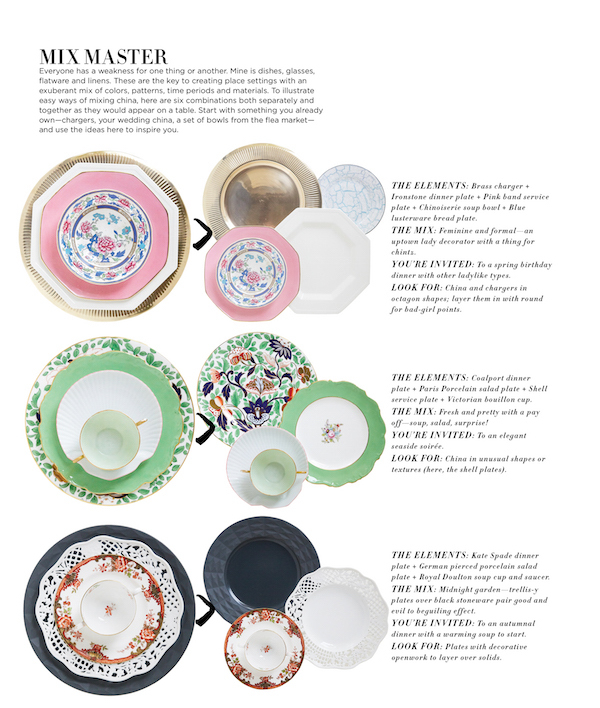 The last few chapters are instructional and inspirational how-to’s on style – from curating “an arsenal of essential multipurpose pieces” to how to mix “colors, patterns, periods & styles” to how to entertain with elan and panache! 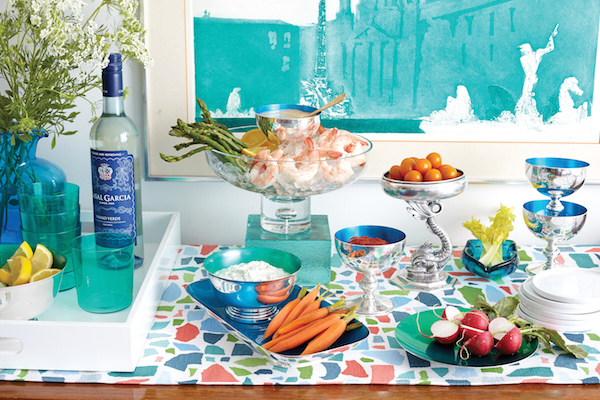 With a passion for tabletop, I loved this section on creating layered and inventive settings. 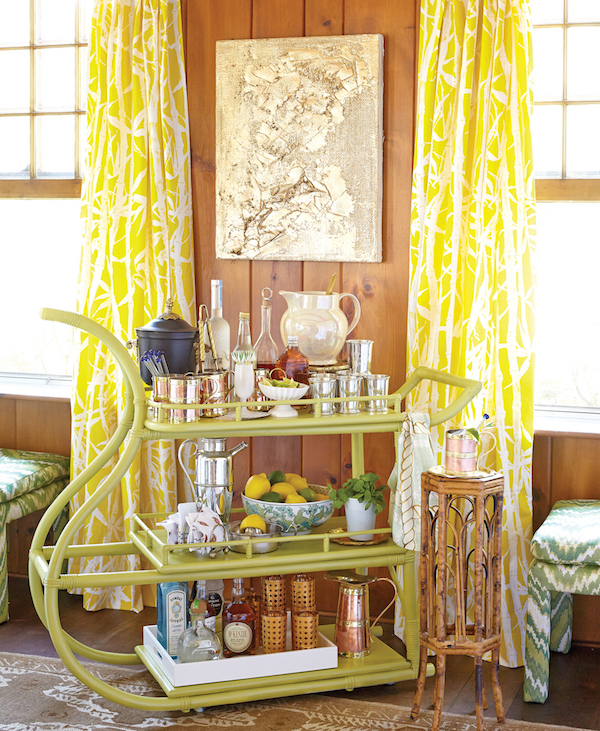 And in Eddie’s and his partner Jaithan’s former country house, he shows how a bar cart is one of his entertaining essentials.You can see, in this Kentucky Derby pre-party vignette, how this vintage bent bamboo beauty packs a stylish punch. 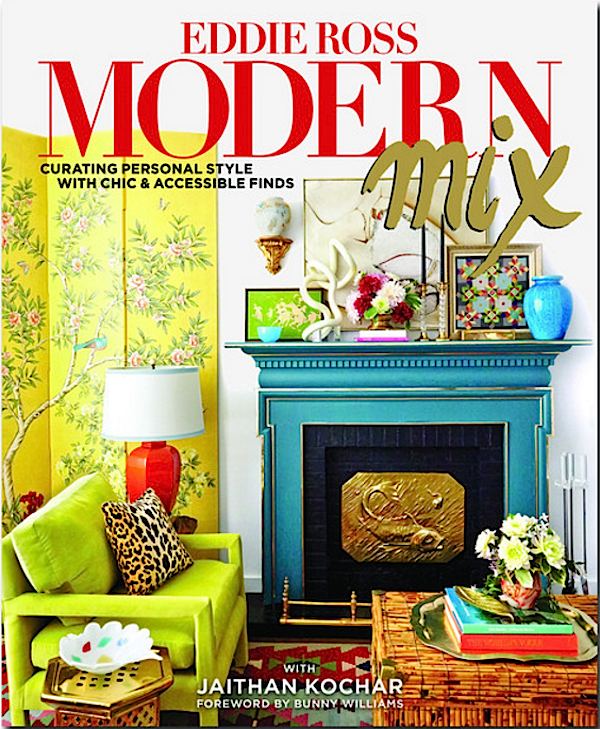 Not only is Modern Mix full of stylish advice and information but with a fantastic graphic layout and book design, it’s a fun and entertaining read. It’s the perfect pre-holiday prep purchase! And for a special behind the scenes treat, join Susanna Salk and me for a country romp at the enormous Elephant’s Trunk flea market in Connecticut for a real life lesson with Eddie in the art of the find!! 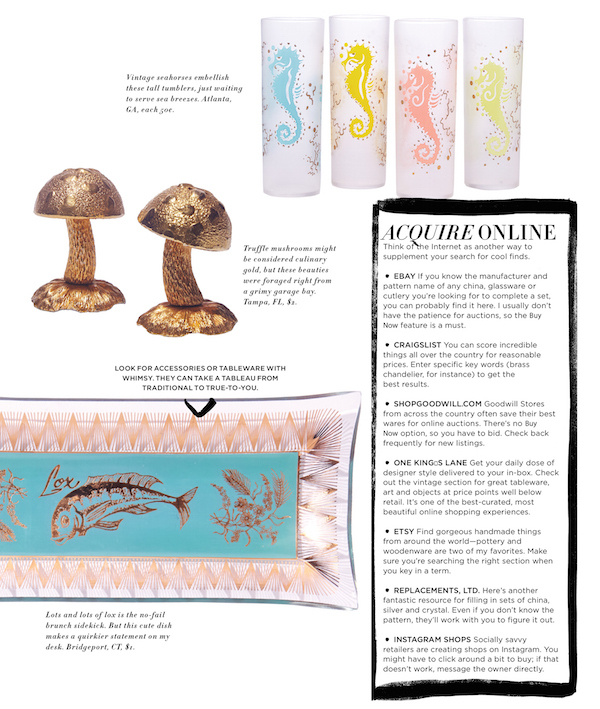 This entry posted in books, design, food and drink, interior design. Entry Tags: Design Books, Eddie Ross, entertaining books, interior design, styling, Tabletop, thrifting Bookmark the permalink. Eddie has been a treasure to me from the time he started his blog, to when he and Jaithan came to Kansas City a few years back for a seminar at Creative Candles! He always astonishes me with his finds! Thanks for a wonderful video as well Susanna and Stacey. A terrific book to always keep on hand! Oooh, this is right up my alley. And I will definitely look with sharper eyes and a wider perspective when digging through my local depot-vente! Merci as well for the very fun video. I love Eddie! His tips are practical and his energy makes everything fun. This sounds right up our alley! Can’t wait to pick up a copy! We had the chance to see Eddie speak in Rye earlier this month and he had us all in stitches. Not only is he as charming as it gets, his passion for the Modern Mix is intoxicating. 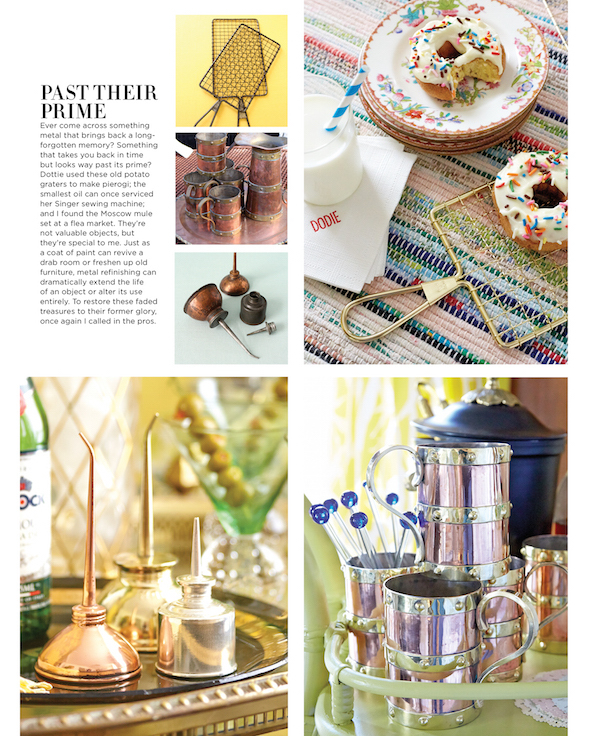 Now, that doesn’t mean you’ll find us at flea markets and polishing old silver, but we were enchanted all the same. He’s taken Martha’s bar and moved it way up! 84 queries in 1.186 seconds.